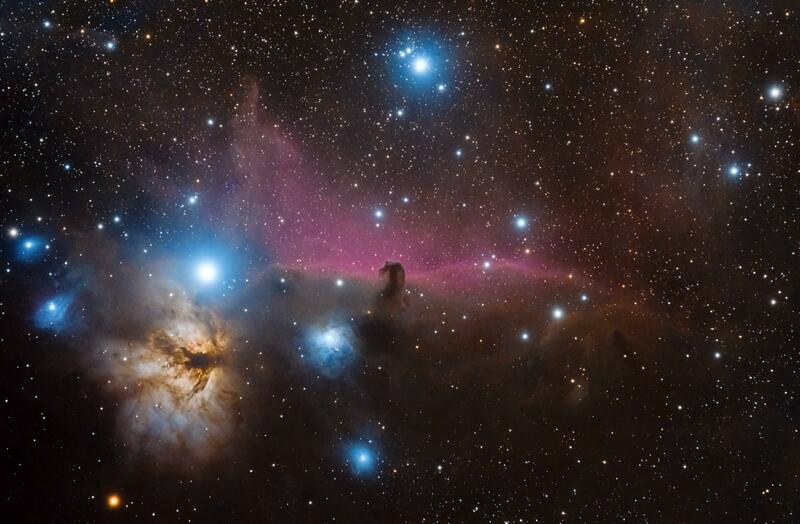 Ic 434, better known as the Horsehead Nebula, is perhaps one of the most stunning views in the Autumn/Winter sky. This massive star forming region in Orion is also one of the most recognizable due to its dark horse head silhouette in the center. This tower of dark dust known as B33 casts a multi-light year long shadow down and to the left. B33 is silhouetted against a bright pink background of ionized hydrogen. The long tendrils faintly visible in the hydrogen are actually long strands of the hydrogen that have been pulled by massive magnetic fields. Not to be outdone, the Flame Nebula shines brightly just to the left of the Horsehead Nebula. Like the Horsehead, the Flame Nebula is a stellar nursery glowing with the light of young stars and ionized hydrogen. Surrounding the bright yellow and orange of the Flame are various glowing blue regions. These are other star areas lit up by their hot blue baby stars. ALSO visible in this image is the star Alnitak, the bottom star of Orion’s Belt. This is just unbelievable. Thank you for sharing this remarkable image! really incredible images. Fascinating information. Keep it up Jake. THIS IS JUST SO BEAUTIFUL OMFG!!!!!!!!!!!!!!!!!! Seriously. Are you using any sort of filter or modifications to your D5300 to help get these great images? You are more than welcome … all the images are fantastic. What control software, ISO and exposure are you using? … sorry for all the questions but I’m a D5300 user myself. I was using a UHC filter but that gave everything a greenish cast. Trying an IDAC P2 filter now .. sadly I live too close to a city in England and light pollution is an issue.